What caused the "Global Financial Crisis" (GFC) that erupted in mid-2007? What will be the consequences of the actions undertaken by governments to combat it? The more things change, the more they stay the same: the GFC is merely the latest in a long series of economic and financial crises that have punctuated the history of the past 250 or so years. Like its predecessors, three of which (namely the Panic of 1907, Depression of 1920-1921 and Great Depression of 1929-1946) this book analyses in detail, poor policies – in particular, the existence of legal tender laws, fractional reserve banking and central banking – are the GFC's ultimate causes. The logic and evidence is inescapable: in no financial and economic crisis have the same non-monetary phenomena been present; and in no crisis have these monetary phenomena been absent. Scientists, it seems, stand on the shoulders of giants; today's bankers, mainstream economists and politicians, on the other hand, continuously repeat the errors of their pygmy forebears. The intervention of government – and not the free market – causes the financial crises in Wall Street that become economic crises in Main Street. Indeed, the GFC's eruption demonstrates that "capitalism" (a term of abuse coined by Karl Marx to smear his opponents) hasn't failed; socialism has. It wasn't extreme capitalism (a term of abuse coined by ex-Prime Minister Kevin Rudd to smear his opponents) that caused the panic and bust: it was the partial, corrupted and bastardised capitalism of the "mixed economy" that he and the mainstream champion. Accordingly, the eradication of crises necessitates the repeal of pernicious laws (such as legal tender) and the abolition of damaging practices (namely fractional reserve and central banking). 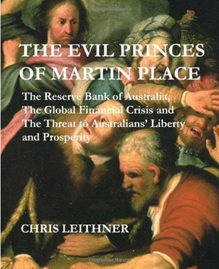 Chris Leithner is a Director of Leithner & Company Pty Ltd (www.leithner.com.au), a private investment company in Brisbane. He is also the author of The Intelligent Australian Investor: Timeless Principles and Fresh Applications (John Wiley & Sons Australia, 2005).